A PDQ Deploy package is a set of one or more deployment steps that are executed on target computers. Use the Package window to create and edit packages. For information about creating and editing packages, see Creating and Editing Packages. 1.On the tree expand Packages, then select a package. 2.Double-click it, or on the Package page, click Edit Package. 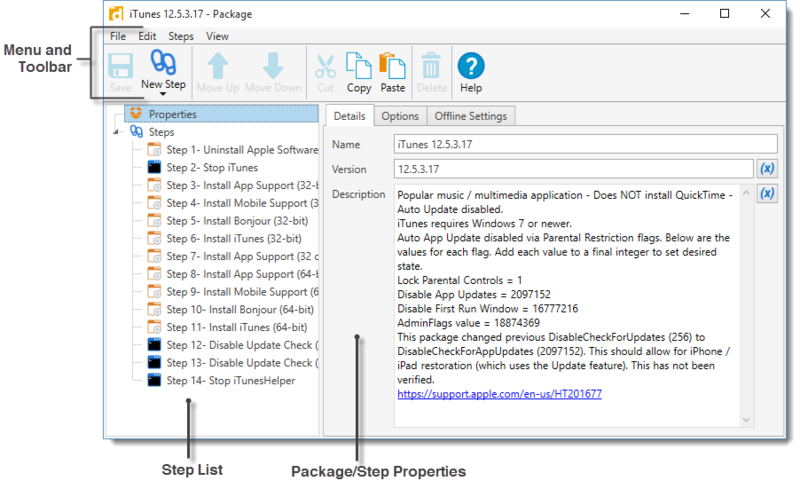 The Package window has three primary components—the Menu and Toolbar, the Step list, and the Package/Step Properties. Packages that are set to Auto Download will show Pre-Steps, the Steps of the Library Package, as well as the Post-Steps. The Menu and Toolbar contain the controls and commands you use when creating and editing packages and package steps. Click Package Properties or a step in the Step List to display and edit the package or step properties in the Package/Step properties. For details about package and package step properties, see Package and Step Properties.